Piriformis syndrome is an uncommon neuromuscular disorder that is caused when the piriformis muscle compresses the sciatic nerve. This muscle is involved in the lower body to stabilize the hip joint and lift and rotate the thigh away from the body. The Piriformis muscle aids us to walk, shift our weight from one foot to another, and maintain balance. This muscle is also very important in playing sports; especially Golf and Tennis. The sciatic nerve runs underneath the piriformis muscle. 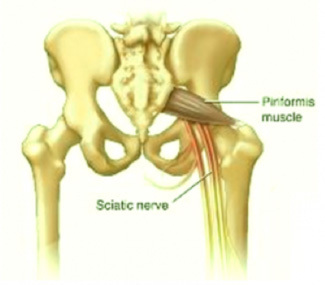 Spasm to the piriformis muscle can cause the sciatic nerve to compress and it usually starts with pain, tingling, weakness, pins and needles, or numbness in the buttocks. Piriformis syndrome can cause pain in the lower back, groin, perineum, and buttock and hip. But the most common symptoms is pain in the lower back and/or pain that radiates to the buttocks and down the leg and up to the knee. If it is a true sciatica pain then the pain shoots all the way down the leg. This can be a very painful condition and for some people, it can also be very disabling. Fortunately, for the majority of people, chiropractic treatment is very effective in treating this condition. An accurate diagnosis is always the key to successful treatment. Build-up of scar tissues within or between muscles and tendons cause reduced range of motion, loss of strength, and pain. Since our peripheral nerves also course along the fascia and between muscles and tendons, they can easily become trapped by the scar tissues as well. In our Fort Myers office we use chiropractic technique, physiotherapy as well as active release technique. Dr. Chery uses her hands to evaluate the exact location, texture, tightness and movement of the muscles, fascia, tendons, ligaments or nerves that are involved with your symptoms and sets up a treatment plan. If your low back is preventing you from enjoying your life and you are tired of being in pain then call Dr. Chery at Chery Chiropractic Center and start on the road to recovery. Providing the most trusted chiropractic care to Fort Myers, Lehigh Acres and Cape Coral residents.